West African nations plan to scale back a military force that secured the return to The Gambia of new President Adama Barrow to take power, the force commander said Friday. The mission of the Economic Community of West African States (ECOWAS) regional bloc will see “a progressive reduction” in numbers, Senegalese General Francois Ndiaye said in a statement a day after the newly elected leader flew back to his homeland. Barrow defeated longstanding hardline ruler Yahya Jammeh at the polls in December. He took refuge in neighbouring Senegal on January 15, fearing for his safety after Jammeh reversed his acceptance of the election result and sought for six weeks to cling to power. 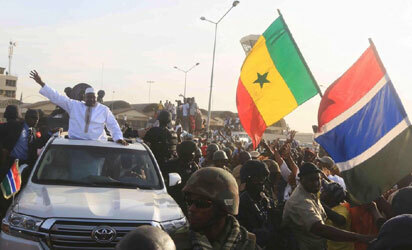 The new leader was welcomed home by jubilant crowds on Thursday — five days after Jammeh left the country under strong pressure from the 15-nation regional bloc — while heavy security was laid on by Senegalese and Nigerian special forces. The decision slowly to cut back on the military deployment was prompted by Barrow’s arrival and “a positive appraisal of the security situation in the country”, Ndiaye said. Asked how many men were part of the mission, known as MICEGA, Ndiaye declined to say. Last weekend, the chairman of the ECOWAS Commission, Marcel Alain de Souza, indicated that some 4,000 troops were already deployed out of a planned maximum of 7,000 drawn from five nations. ECOWAS launched the deployment on January 19, shortly after Barrow took the oath of office in The Gambia’s embassy in Dakar, then suspended military action to give a chance to final diplomatic efforts to have Jammeh give way. No details of Barrow’s agenda were available by late Friday morning, but many Gambians have placed their hopes in the former real estate agent endorsed by several opposition parties ahead of the election. “I went up to Westfield last night,” Mumin Jallow, a 38-year-old taxi driver told AFP, referring to the biggest street party for Barrow’s arrival, near Banjul.